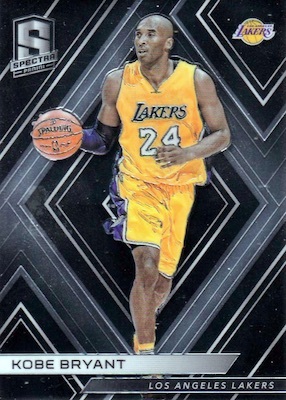 Bright and bold, 2017-18 Panini Spectra Basketball packages the Optichrome shine and wild colors for another NBA season. 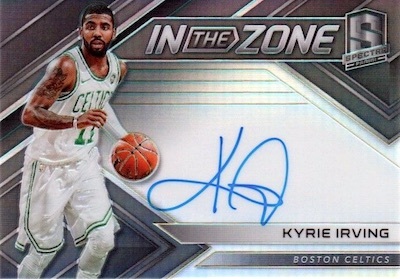 While 2016-17 featured seven hits per box, 2017-18 Panini Spectra Basketball averages three autographs and three relics. There are also a few other changes in store. 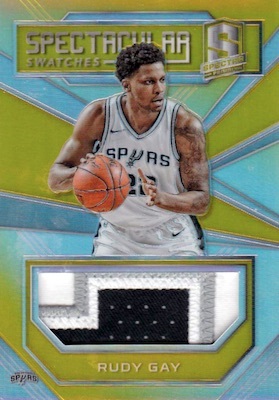 The first thing collectors will notice about the 2017-18 Panini Spectra Basketball checklist is that the base set now includes rookies. In addition, the base release sees an update to the parallel lineup, with short-printed Silver Prizms averaging two per case, and the one-per-case White Sparkle. Other colors in the rainbow consist of Neon Blue (#/99), Red (#/75), Neon Green (#/49), Neon Pink (#/25), Gold (#/10), Neon Orange (#/5), and Nebula (1/1). However, just because the base set has rookies, it doesn't mean those are the only first-year cards in play. 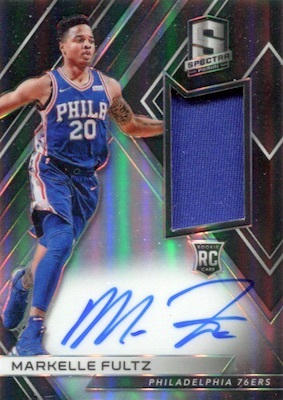 The hard-signed Rookie Jersey Autographs line is numbered to 299, with Neon Blue (#/99), Neon Green Prime (#/49), Neon Pink Prime (#/25), Gold Prime (#/10), Neon Orange Prime (#/5), Nebula Laundry Tag (1/1) parallels. 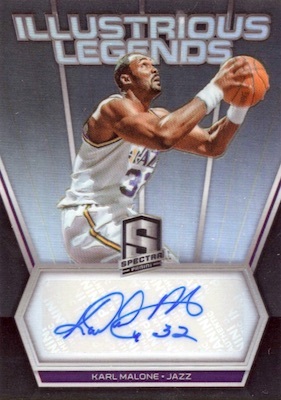 Amping up the flash, 2017-18 Panini Spectra Basketball also has vivid signed options in Illustrious Legends, In the Zone and Rising Stars. 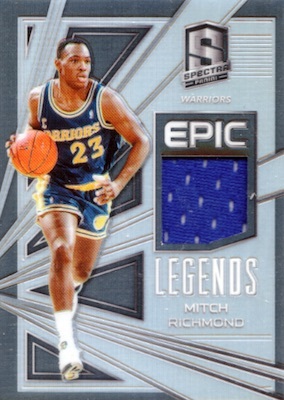 These offer a wide array of low-numbered parallels, as well. 2017-18 PANINI SPECTRA DONOVAN MITCHELL RISING STARS AUTO GREEN PRIZM #2 35!! 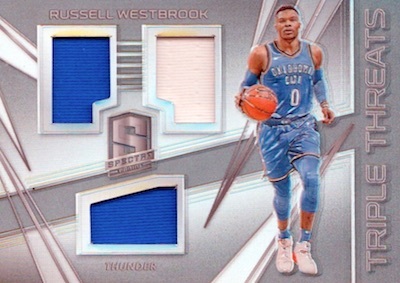 PARALLEL CARDS: Silver (2 per case), White Sparkle (1 per case), Neon Blue #/99, Red #/75, Neon Green #/49, Neon Pink #/25, Gold #/10, Wave #/9 (FOTL), Neon Orange #/5, Nebula 1/1. PARALLEL CARDS: Neon Blue #/99 (Fox #/76*), Neon Green #/49, Neon Pink #/25, Gold #/10, Neon Orange #/5, Nebula 1/1 (No Collins*). 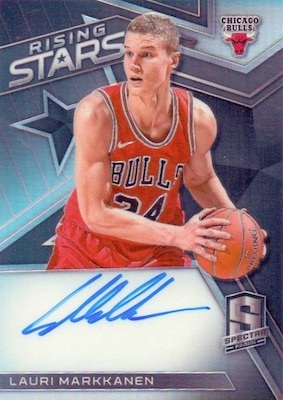 Buy 2017-18 Spectra NBA autographs on eBay. PARALLEL CARDS: Neon Blue #/49, Neon Green #/25, Gold #/10, Neon Orange #/5, Nebula 1/1. PARALLEL CARDS: Neon Pink #/25, Gold #/10, Neon Orange #/5, Nebula 1/1. 18 cards. Serial numbered #/49. 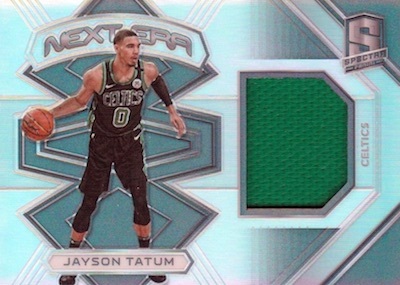 PARALLEL CARDS: Neon Green #/35. PARALLEL CARDS: Neon Green #/25, Gold #/10, Neon Orange #/5, Nebula 1/1. 17 cards. Serial numbered #/49. PARALLEL CARDS: Neon Blue #/49, Neon Green #/35, Neon Pink #/25, Gold #/10, Neon Orange #/5, Nebula 1/1. 38 cards. 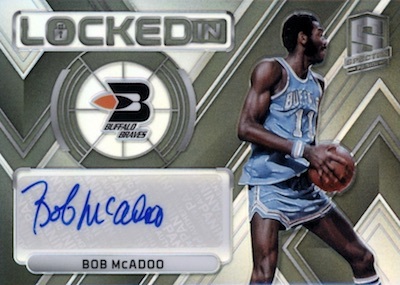 Serial numbered #/199. 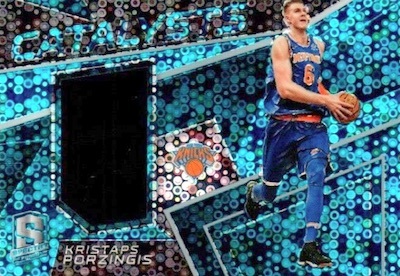 PARALLEL CARDS: Blue #/99, Neon Green #/25, Neon Orange #/5, Gold #/10 (Beal #/9*), Nebula 1/1. 30 cards. Serial numbered #/149. PARALLEL CARDS: Neon Blue #/99, Neon Green #/25, Gold #/10, Neon Orange #/5, Nebula 1/1 . PARALLEL CARDS: Neon Blue #/99, Neon Green #/25, Gold #/10, Neon Orange #/5, Nebula 1/1. 29 cards. Serial numbered #/99. 38 cards. Serial numbered #/99. 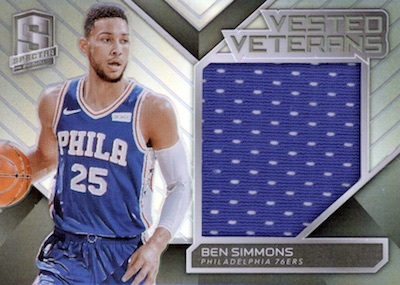 View the full 2017-18 Panini Spectra Basketball checklist spreadsheet. Do you know if there’s going to be hobby of this (Walmart and/or Target) or is it just hobby? Looks to be Hobby-only like normal.